After a little more than a year of waiting, the vice postulators for the sainthood cause of Blessed Francis Seelos received word recently that Vatican experts have declined to consider the cure of a Maryland woman as the second miracle needed for Seelos’ canonization. While the review panel agreed that Mary Ellen Heibel’s sudden cure from metastatic esophageal cancer in January 2005 was extraordinary, the group hesitated to confirm it as miraculous because less than 10 years had passed since the cancer disappeared, and Mary Ellen Heibel passed away in October 2009. The Redemptorists remain grateful to the Heibel family for their assistance, we pray for the repose of the soul of Mary Ellen, and we continue to pray that one day our confrere will be recognized as a saint. 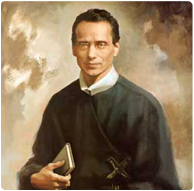 Blessed Francis Seelos, pray for us!